I think that judging is one of the most (or the most) important aspects of a designer. Design is ultimately the result of a series of decisions, right? And also a good combination of thinking and intuition: finding a solution based on your knowledge but also on that part of your brain that tells you to break the rules a bit. but probably a good designer fits into a team of a lot of these. it seems if you got a bunch of the same people together, you wouldn’t get a variety of ideas and perspectives. ISFJ (though I was “moderate” or “slightly” skewed toward a couple of those)! Guess I was destined to be a designer! Also, only 3% of the population, again, surprise! I’m ENTJ. So I guess I help think through and structure problems and solutions as we all work through things together. INTJ here aswell. But feel that its not completly thru as I belive I should score much higher in the artisan role. Think the test lacks in emotional/romantic evaluation. But hey, what do I know, I’m only a mastermind! Mike – So far you’re the only person who is a P. I’m actually an extreme J, so this one is the hardest for me to wrap my head around. Can you think of any specific times when the qualities of perceiving helped you be successful? I’m an INTJ and I would strongly make the case that it’s better suited for design than ISFJ. INTJs are more abstract and look at the bigger picture. They are also objective which is important when designing for others, rather than yourself. However, the beauty of the design is that it’s not exclusive to anything. It’s a study that involves multiple disciplines and backgrounds. Jared – You make a good point. There is admittedly going to be some bias with this experiment because people are volunteering for it. This probably means that we’ll have more J’s than P’s. J’s seek to control their world through organizing it, and this is one form of organization. We might also have more N’s than S’s too, because N’s rely on information in the imaginative or internal worlds rather than from the external world. Does anyone have any feeling that their personality types will lead them toward specific roles within a design organization? Is a TJ a destined product manager or an SF the ideal researcher? Who would make the better design director, ENFJ or ENFP? Jeff – as a fellow INTJ I completely agree with you One thing I’m wondering most about is how people with other traits complement our type. For instance, I seek organization of information and that means I’m susceptible to rushing to conclusions. Someone with the Perceiving trait, on the other hand, likes to keep their options open but can struggle to make a plan or decision. Which is better as a manager? I’d like to think the J…Which is better in brainstorms? Maybe the P? INFJ = “distinctively expressed a judging personality” -yeap, sounds about right for me! 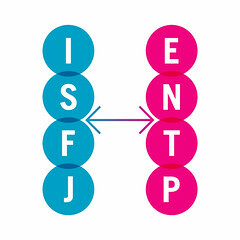 Interesting point of discussion though: I took a Myers-Briggs test at my first co-op and was ESTJ; four years later my personality has changed – is that a result of being a designer? Michael- I think my personality type is accurate in its description i that way. And today it’s certinly something I plan and stive for in my future to be in a leading position. I’m an INTJ… which is the rarest personality type, somewhere between 1% and 5% of the population i believe, so i’m kind of surprised to see how many have popped up on here! I have had several discussions with colleagues about this over the past few years, and the consensus has generally been that you need a range of personality types to create a good project team, otherwise you end up with too many people that only fill one role. Some of the best people i have had good work chemistry with have very different personalities from mine. Another INTJ here. I found it interesting that in the description it mentioned that “INTJs enjoy developing unique solutions to complex problems.” I think that describes a lot of industrial designers. I’m an INFJ : in the ratio of 100/50/12/11 according to the test. but I guess my best strength as goes for my result is not loosing the big picture in any task. INTJ … although I really would have thought Thinking would have been higher on the score. ENFP used to be INFP. For me I was less curious about what I was than what most designers would result with. The broad idea of what a visual designer is and the kind of work they do allows for many personality types to take the title. Recently my designer boyfriend and I got into a little fight about what I do and if what I’m interested constitutes as real design. And big news fellow Judging Thinkers. It does. And what do I do? I help other people communicate their ideas and better cater to their audiences visually and interactively. I do a bit of research, but I also love to create vectors, make art, write, and compose music. However, for me designing to solve a problem and designing as almost an art form are two fundamentally different things. It’s just much harder for me to straddle the midway point, designing something totally unique and useful. A cool object or service. Industrial Design… that sells or realizing beautiful designer web app. These things elude me. I’m a storyteller. And I think my personality type and the way I see and perceive the world is important if not essential for this goal. Being able to remove myself from as many preconceptions as I consciously can, yet also being able to tune into the feelings and mood of the world, the economy, the story, the people involved. This is what I do.